Pte. Wm. G. Mair is reported missing since Nov. 12, according to word received by his wife at 584 Eastern avenue. Pte. 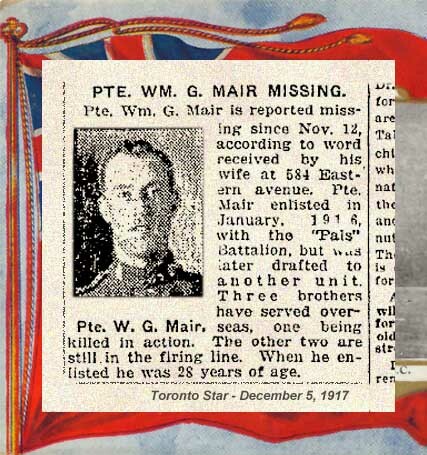 Mair enlisted in January, 1916 with the “Pals” Battalion, but was later drafted to another unit. Three brothers have served overseas, one being killed in action. The other two are still in the firing line. 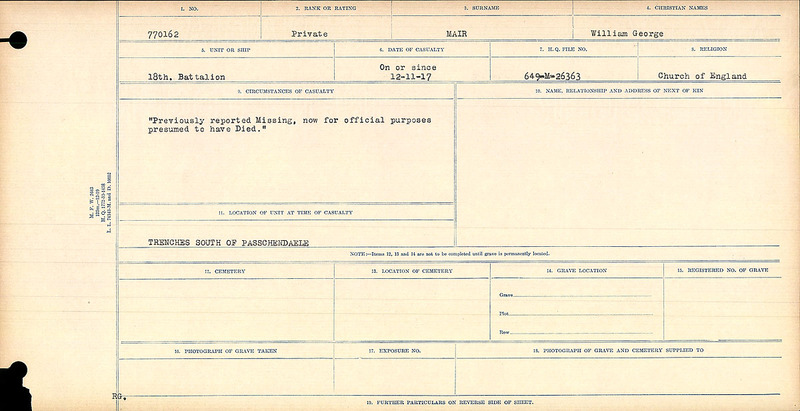 When he enlisted he was 28 years of age. Toronto Star. December 5, 1917. Mrs. William Mair, 584 Eastern ave., received official work that her husband, Pte. William Mair, is presumed dead. He was reported missing the 12th of November last year. Enlisting with the 124th Battalion, 1915, he wend overseas in August and to France in September. His wife and two little daughters live here. Pte. Mair was born in England, and had been in Toronto about six years, being employed by the Dunlop Tire Company. He is one of four brothers, tow of whom have made the supreme sacrifice. The brothers are Edward, Charles, and Albert. 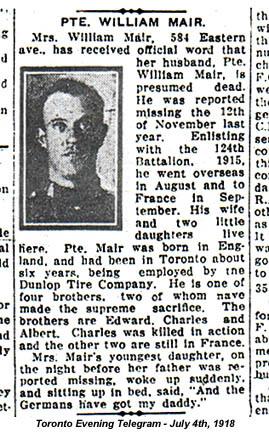 Charles was killed in action and the other two are still in France. Toronto Evening Telegram. July 4, 1918.